Have you read Angela's Ashes? Well, the aim of this book is pretty similar. 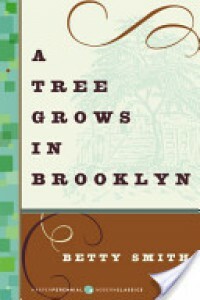 An implicitly autobiographical story about Frances Nolan and her family, during her childhood at Brooklyn. In the novel it's not a simple point in the map, a casual location where the author places the characters, but it is extremely alive. Here it figures as the home of the not-so poor but not-so rich, the home of who has the costant fear of not being able to have a decent daily income (or, like we could say today with the monthly salaries, to make it at the end of the month), but in one way or another there's always a solution to make it by their own till the end. Here the art of getting by rules. There's an unbearable number of days where a soup bone is the only offer for lunch and dinner, but there are also those bright and joyful Saturdays where Frances can spend the saved cents for a little sweet. On the first side, Frances doesn't want to show to dear strangers her homeland, so dirty and poor, but on the latter side, when she saw Manhattan and the upper-area of New York a deception came, because..Brooklyn is better, Brooklyn is hers. In fact in this place all the sorrows and joys of the first two decades of Frances Nolan grow, burn and then consume theirselves. And this is the telling of those times, the times when we were living in Brooklyn. And I loved it. A "fat" book but extremely fluid. I've felt completely into the story and their characters, with the little events of everyday life, those unavoidable unfortunate events of a lifetime and on the same line also those accepted with a big smile. It was so genuine and the character were vivid, real. I don't share the critic of others towards the "sentimental" tone and I don't understand why when we deal with poverty all has to be extremely rough and tough. I've appreciated instead how Frances' perspective has influenced all the story. The pains of living in precarious conditions were tangible, a sort of smell in the air through the entire story, so including the adjective of "idealistic" under "sentimental" would be wrong. And I've loved how it was perceived the deep love of the little Nolan towards the father, even if it wasn't an example of probity. Some moments linked to that were sincerely moving. The grow up of the characters was also real, and I'm so glad that Frances (Betty too) became a strong and self-reliant woman, I would be proud if she were close to me. And I can say that I was feeling all the sacrifices that weighed on her shoulders, the smell of dust in the substratum of the skin due to the need of rull up her sleeves and climb down the craggy reality of living to gain something for herself. I'm really happy, it was such a heartwarming piece of work.